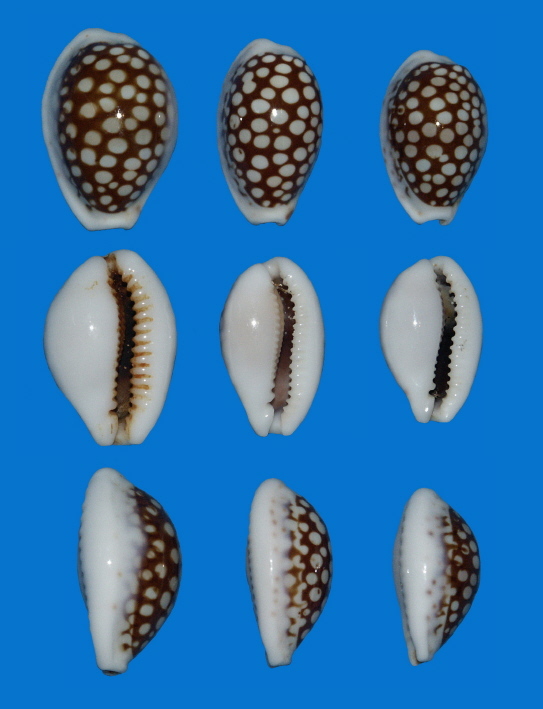 Forms of cribraria comma (Perry 1811) and of esontropia francescoi (Lorenz 2002) and a description of esontropia francescoi form mainland.
. A listing of the sp., ssp. 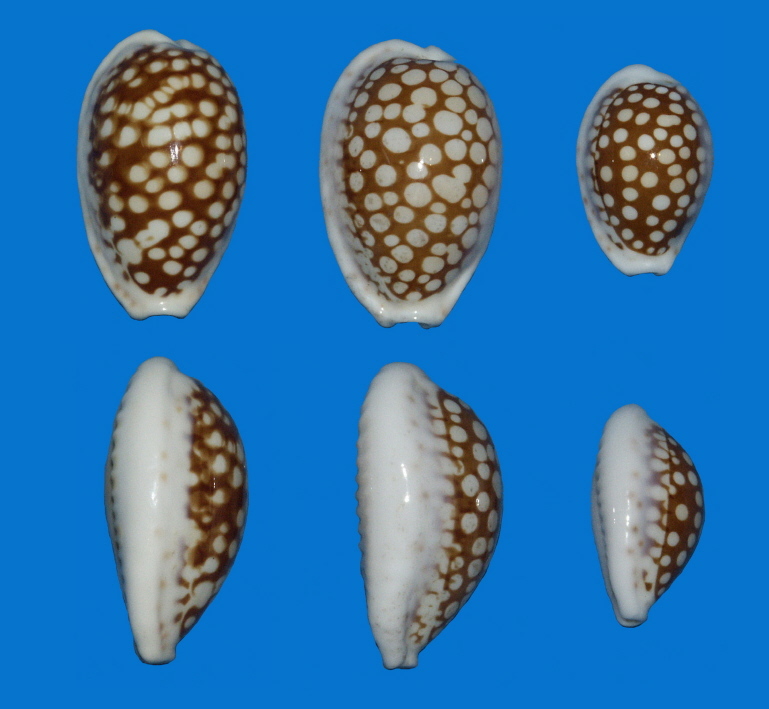 and forms of the Cribrarula of Africa and the western Indian Ocean with their geographical ranges.
. Is there a distinct form of cribraria comma?
. Is esontropia francescoi form mainland indeed a ssp. of esontropia or should it be considered a ssp. of cribraria or even a form of cribraria comma?
. A description of esontropia francescoi form mainland.
. Could there be a distinct regional variation of esontropia francescoi form mainland? The distribution extends from Tanzania to Somalia. 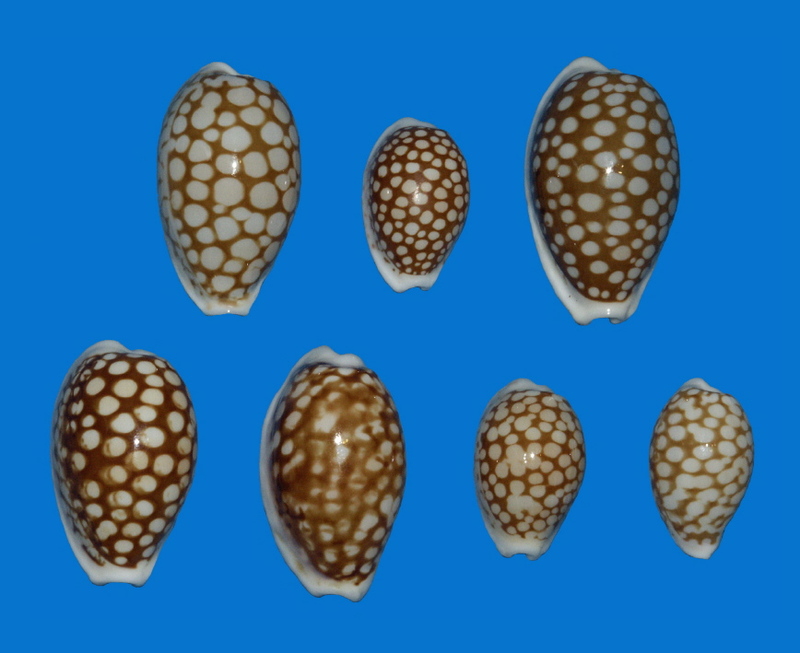 The shells are elongate oval to cylindrical. The labral margin is rounded, hardly callous. The columellar margin is hardly callous. Marginal spotting is rarely found and if so, would be faint along the upper labral margin but absent on the base and columellar side. The ground colour is pale purple, showing very faint transverse banding. The dorsal netting is coarse, the coat colour is rather dark brown, forming small lacunae. He considers this to be the typical c. comma. The distribution range covers the KwaZuluNatal Province of South Africa, Mozambique and Madagascar. 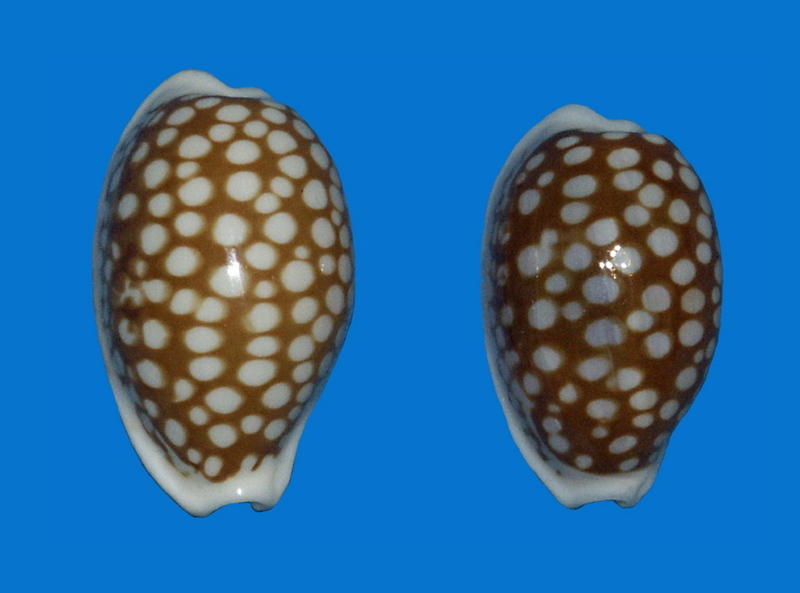 The shape of the shell is oval, often callous. (Massier has in his collection specimens of this oval, callous form originating from mainland Tanzania as well as Zanzibar.) The labral margin is rounded and rather callussed. The columellar margin is often rather callussed. The marginal spotting is often distinct along the upper labral margin with some spotting rarely on the columellar margin and the base always unspotted. The ground colour is saturate purple with distinct darker transverse banding. The dorsal colour is very dark brown, forming small lacunae. From the description and with specific attention to the references about labral margin spotting and the callussed labral and columellar margins, these specimens could only refer to e. francescoi form mainland which Lorenz described in 2002. Merlin is of the opinion that specimens in his collection of Variation B from Mozambique and Madagascar, are similar to Variation A and that these are often confused with e. francescoi : "Dans la forme B toutes celles que nous avons du Mozambique et de Madagascar sont semblables à la forme A. Il semblerait qu'il y ait souvent confusion avec francescoi. The further discussion of this as a definite form of c. comma is inhibited by the lack of a sufficient number of specimens from these localities. The name "tanga" might well be invalid because the form could extend beyond Tanga Bay. I obtained a very globose specimen of c. comma from KwaZuluNatal Province, South Africa. It was dubbed "vallendum" on its original identification slip. 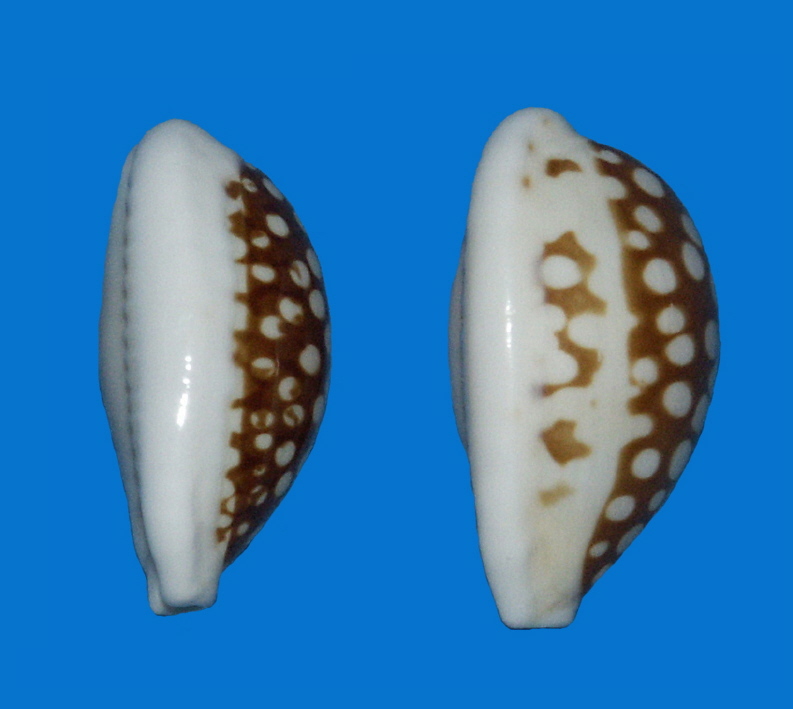 The specimen was beach collected in 1985. I assume that the "val" in "vallendum" refers to the South African collector Val van der Walt from whom I obtained the specimen. It has some but not all of the features of e. francescoi form mainland. This should be considered an anecdotal exercise to identify a specimen with prominent differing features. However, if a case can be made out that this is indeed a specimen of e. francescoi form mainland, then it must be considered the earliest attempt to name the form. Lorenz describes the shape of c. abaliena as oval, callous with the labral side rounded and callous and the columellar margin very callous and bent-up. The ground colour is pale orange with no conspicious transverse banding. The dorsal netting is wide, complete, pale brown and forms large lacunae. Is this a variation of c. comma? Or an intermediate between c. comma and c. abaliena? Lorenz accepts the sharing of the same geographical region of these two ssp. just as he acknowledges the co-existence of e. esontropia and e. cribellum and by cumingii cumingii (SOWERBY I 1832) and c. astarayi (SCHILDER 1971). "The holotype is a moderately leightweight shell of elongate-pyriform shape, with slight development of callus around the margins but a rather thin base. The extremities are short and rather blunt. The aperture is wide and slightly curved behind. It widens anteriorly, the anterior canal is constricted. The labral teeth are evenly spaced, rather thin and extend slightly onto the lip. On the columellar side, the teeth are distant and rather thin, relatively few in number, with only the last anterior tooth being thickened. … The extremities and margins are white, the orange embryonal shell is visible through the thin white basal callus. The dorsal ground is greenish-purple, with two paler transverse bands. The dorsum is covered with a dark reddish-brown coat forming numerous large, circular lacunae, many of which overlap. The dark coat ends abruptly towards the labral side, leaving about one-fourth of the dorsum exposed. Above the labral edge there are numerous distinct purple spots which form larger terminal spots towards the anterior extremity. Along the left side there are a few indistinct purple spots in the anterior third. The interior of the shell is dark purple. In the paratypes, the degree of marginal callosity varies considerably. 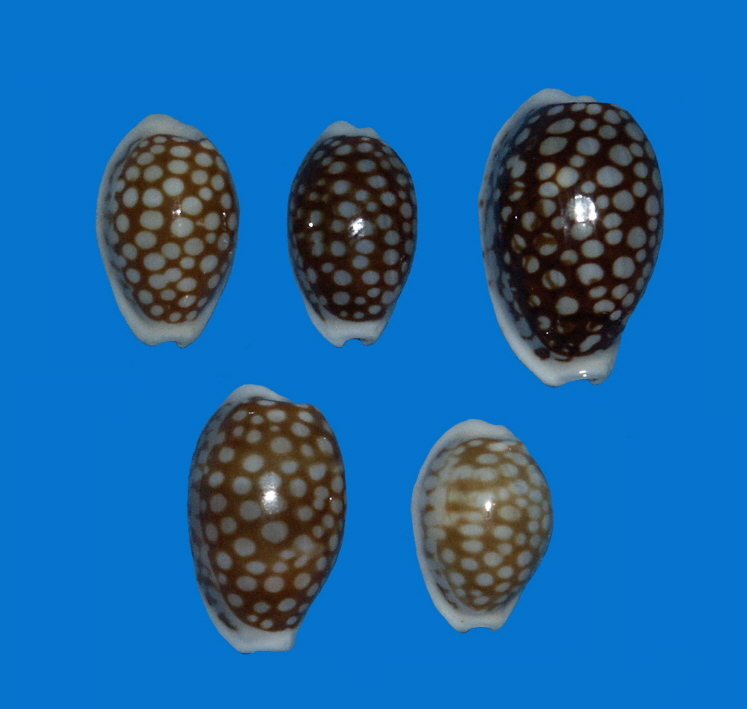 There are slender, thin walled shells as well as very broad callussed specimens. The degree of marginal spotting varies too… the dorsal coat varies in the size and number of lacunae. In nearly all specimens studied, there is no pattern along the labral fourth of the shell." From his earlier commentary on pelliserpentis, it appears as though Lorenz favoured assigning francescoi to c. comma. 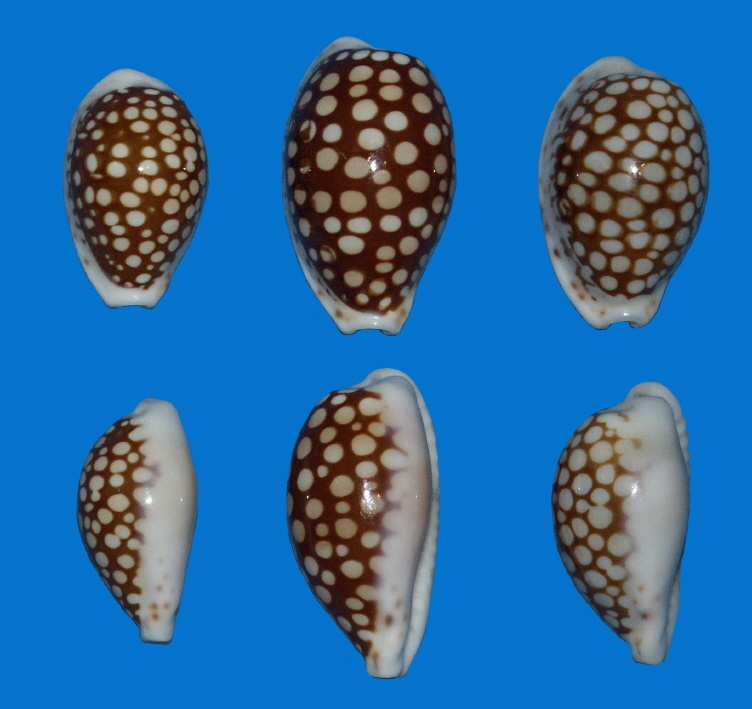 'In Madagascar and Mozambique, an interesting variation of Cribrarula cribraria comma (PERRY 1811) occurs (variation B), which differs from typical specimens (variation A) by distinct spotting along the dorsal edge of the labral margin. This spotting, however, is not present along the columellar margin or on the base. This feature is a fundamental difference to the Mascarenan Cribrarula esontropia DUCLOS, which has lead to confusion in the past, e.g. by myself (see Lorenz 1998). 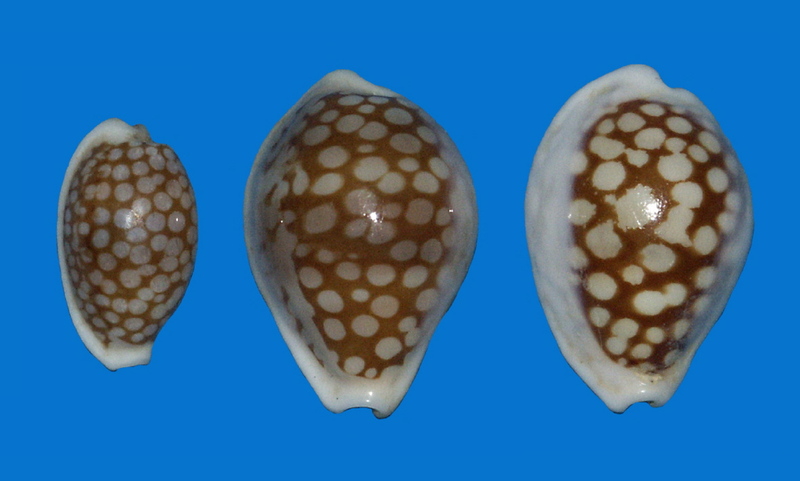 The true Cribrarula esontropia (including its subspecies cribellum) seems really endemic to Mauritius and La Reunion, while all records of the species from other areas in the Indo Pacific and the Persian Gulf seem to be based upon exceptionally well spotted specimens of cribraria comma, cribraria ganteri and the new taxon described herein, Cribrarula pellisserpentis sp. 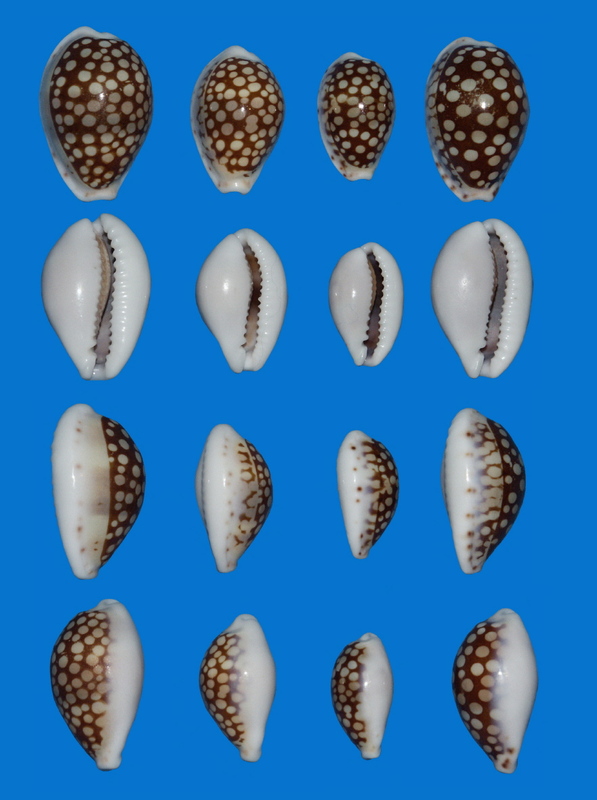 nov."
"In e. francescoi … the collumelar teeth are coarser and less numerous than in all East African species of Cribrarula. This is the main difference also from the East African cribraria comma (PERRY 1811)… in which the labral spotting is rarely found labrally, but is usually absent. Also c. comma has both lobes of the pattern. … The closer conchological resemblance allows a placement of e. francescoi as subspecies of esontropia rather than cribraria." "The recently discovered francescoi from Madagascar differs from its relatives by the absence of the labral lobe of pattern, by stronger dentition and by reduction of the marginal spotting along the left side." Amongst malacologists there is disagreement about such a placement. Some would favour it to be a ssp. of cribraria, i.e. cribraria francescoi and there is also the opinion that it should be considered a form of c. comma, i.e. c. comma form francescoi. "According to Lorenz's map in his new book cribraria comma should not be found further south than Central Mozambique. Well, I have some typical ones from southern Mozambique and northern Natal. 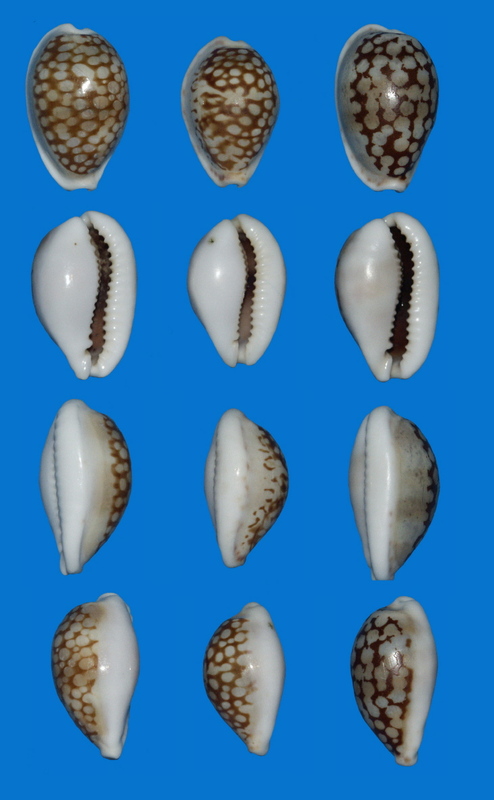 Most shells I have from the mainland are in-betweens of c. comma and franciscoi. Only a few are real franciscoi. This is also an indication that francescoi should rather belong to cribraria and not esontropia. The typical flat and squat shape of esontropia is not found in francescoi. I have never seen in francescoi the heavy marginal spotting of esontropia which even reaches the base. On the other hand I have seen many cribraria comma with the same spotting as francescoi and there are also francescoi with no spotting but all the other features. I can also conclude that francescoi should be called cribraria francescoi and not esontropia francescoi. Seeing that there are so many integrades with cribraria comma and that the geographical distribution overlaps I would call francescoi a form of c. comma and not a subspecies." "I cannot detect the dark dorsal banding in francescoi mentioned by Lorenz in any of my specimens. My tooth count resulted to nothing. In francescoi I counted between 11 – 15 columellar teeth and in comma 12 – 15. This is also supported by the teeth statistics in your work. So I cannot support Lorenz's statement: 'In e. francescoi the columellar teeth are coarser and less numerous than in all East African species of Cribrarula.' I have to state that I do not have enough specimens in my collection to justify a proper statistic with regards to the teeth." The authorship of francescoi is disputed by Merlin and Philippe Quiquandon, France. They claim to have identified it as a ssp. of Cribrarula in advance of Lorenz's publication of his description. 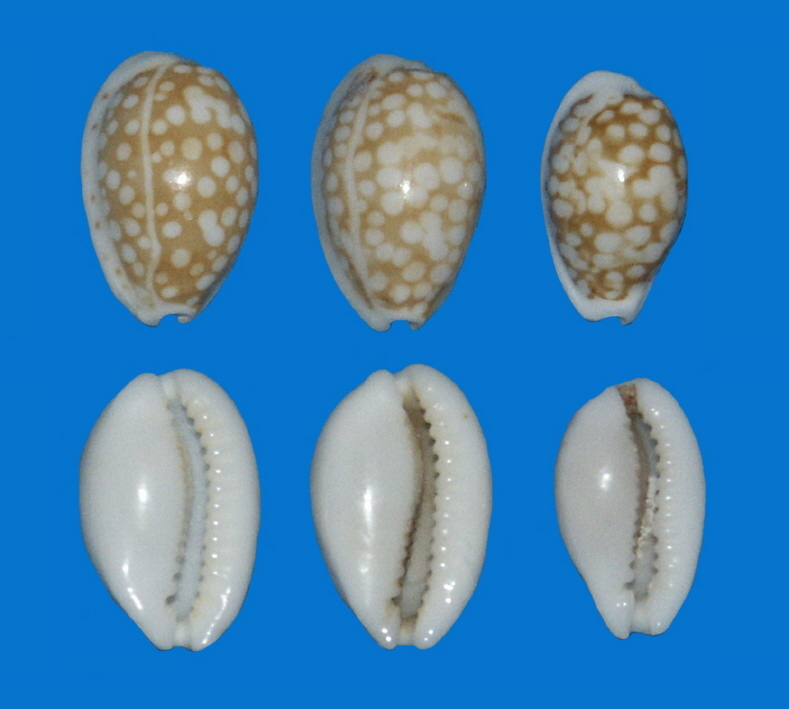 According to Merlin & Quiquandon they showed specimens of these shells that hailed from Madagascar, to Lorenz at the Paris Seashells Show 2002. Lorenz identified them as e. francescoi. The French then published their notes and photographs of specimens in Xenophora. They identified the specimens as e. francescoi but posed the question whether the ssp. should not rather be associated with cribraria. In an article in a later edition of Xenophora, Loïc Limpalaër endorses the Merlin & Quiquandon claim to have identified francescoi first: "As both the authors [Merlin & Quiquandon] explain they preceded the publication of this taxon by Felix Lorenz by a few weeks”. And: “It was inadvertently christened in our columns of [Xenophoria] no 99: Cribrarula esontropia francescoi...". 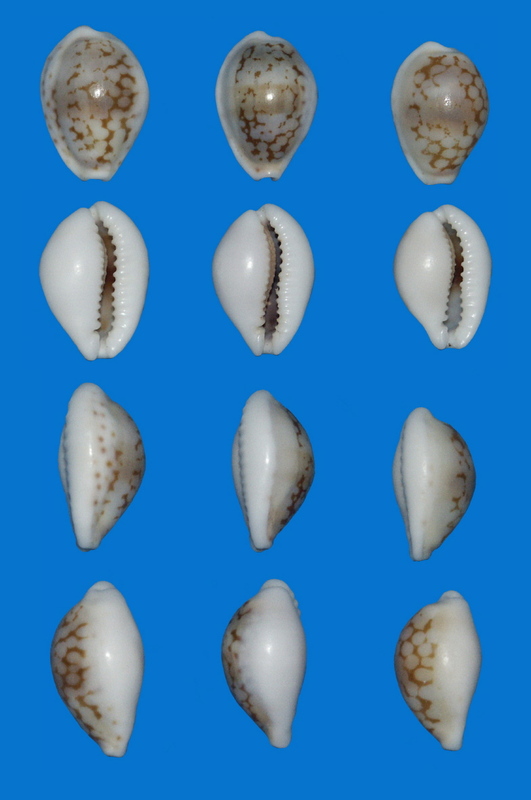 Lorenz has yet to publish specific characteristics for what would constiutute e. francescoi form mainland. 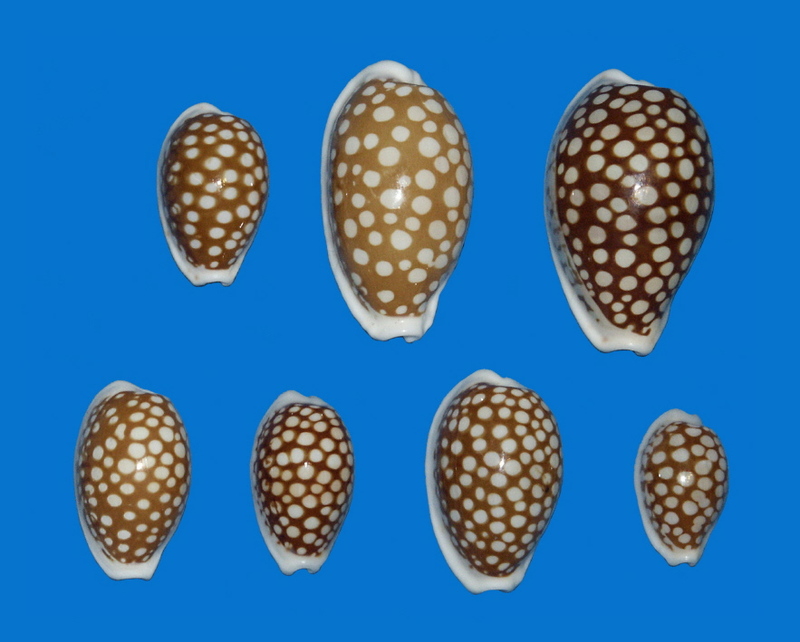 He does provide a photograph of a specimen on Plate 34:6 in "New Worldwide Cowries". 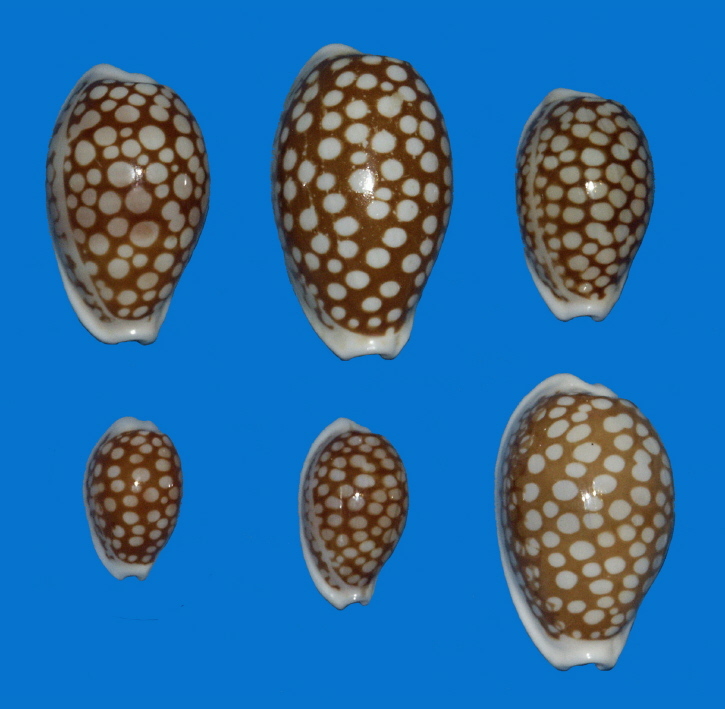 Xenophora edition no 102 has photographs of specimens from Mozambique and Madagascar bearing the identification Cribrarula cribraria francescoi. 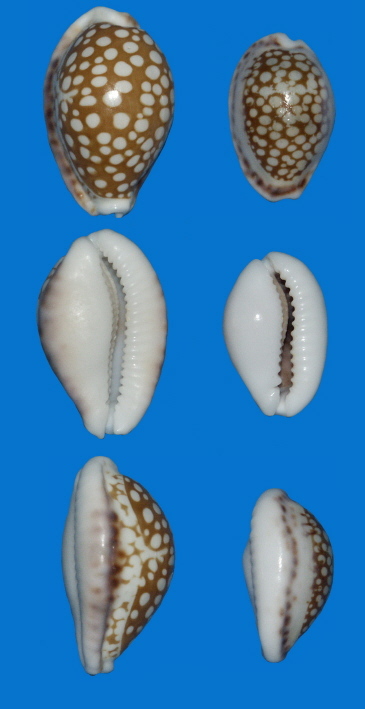 The Madagascar specimen meets Lorenz's description of e. francescoi and the Mozambique specimen would then qualify as Lorenz's e. francescoi form mainland. Xenophora edition no 99 featured a photograph of a specimen from KwazuluNatal Province, South Africa which the authors labeled as c. comma. Because of the largely absent labral pattern and the spotting on both the labral and columellar margins, this specimen would also match Lorenz's e. francescoi form mainland. 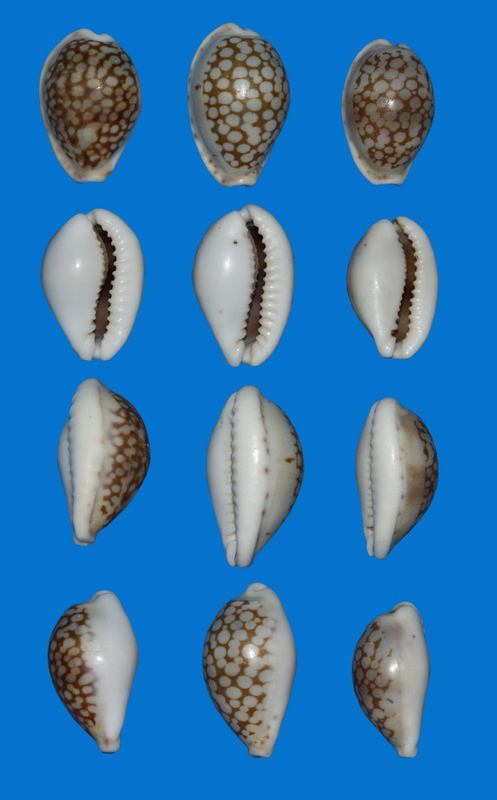 14 Specimens of e. francescoi and 34 specimens of e. francescoi form mainland were available for study. [Plate 15, Plate 16, Plate 17] I am indebted to Jean-Claude Merlin, France, for detailed notes of the e. francescoi form mainland specimens in his collection. Merlin concurs with most of my own observations. Following Lorenz's guideline, e. francescoi is restricted to Madagascar and e. francescoi form mainland is a relative found in Mozambique and the KwaZuluNatal and Eastern Cape Provinces, South Africa. Massier concurs : "I agree with your statement that on average the mainland francescoi is more bulbous than their counterparts from Madagascar, but in-betweens do exist. Merlin also states this fact." There is also a difference in the dorsal coat colour with the mainland specimens ranging from chestnut to bright brown and those from Madagascar being deep brown. The dorsal base colour of e. francescoi show the distinctive green-purple hue whereas the mainland specimens have a more subdued hue that varies from cream-white to green. 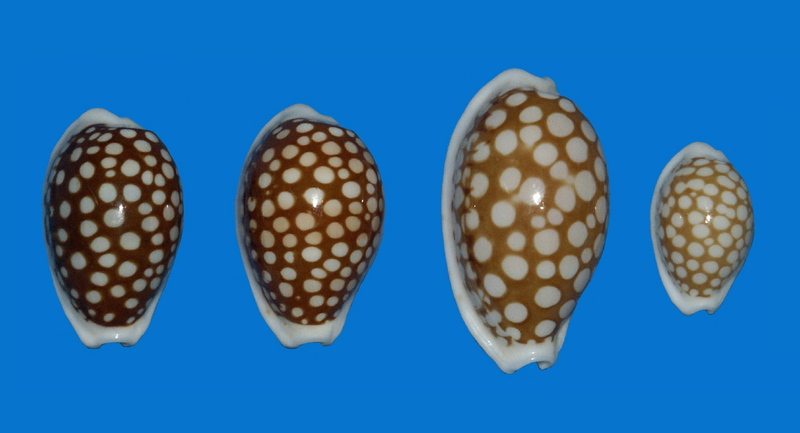 The embryonic banding across the dorsum is visible but not as obvious in the mainland specimens. There is substantially less overlap of lacunae and in some specimens there is no overlap. The labral pattern is often completely absent but more generally greatly reduced. The spotting on the labral margin varies from sparse and scattered to extensive and stretching the length of the entire margin. Spotting on the columellar margin is infrequent and when present, restricted to the anterior extremity. Merlin also identifies intermediates between c. comma and e. francescoi form mainland. His specimens hail from Richards Bay and Park Rynie, both in the KwaZuluNatal Province. Richards Bay lies further north and is not far from the Mozambican border. The most significant difference is that the interior colour is predominantly pale compared with the generally dark interior colour of the true mainland specimens. I favour a more descriptive naming of e. francescoi form mainland. Because of its prominent and eye-catching differences inclusive of the shell shape, colour, lacunae and teeth, I propose e. francescoi form robustus. Until late 2003 the most southern locality of specimens of e. francescoi form mainland in my collection was Park Rynie in the KwazuluNatal Province. 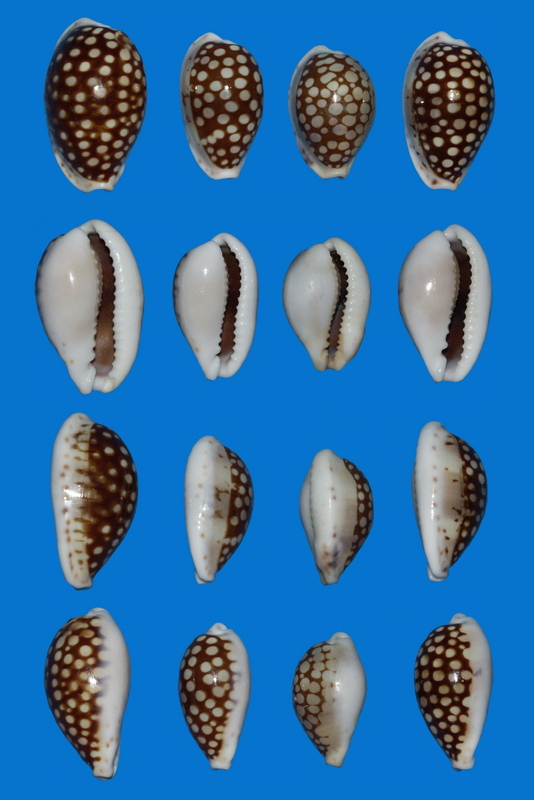 I then acquired a collection 14 specimens from Lorenz that were beach collected in a more southern region stretching from Port Shepstone to Port Edward in the KwaZuluNatal Province. 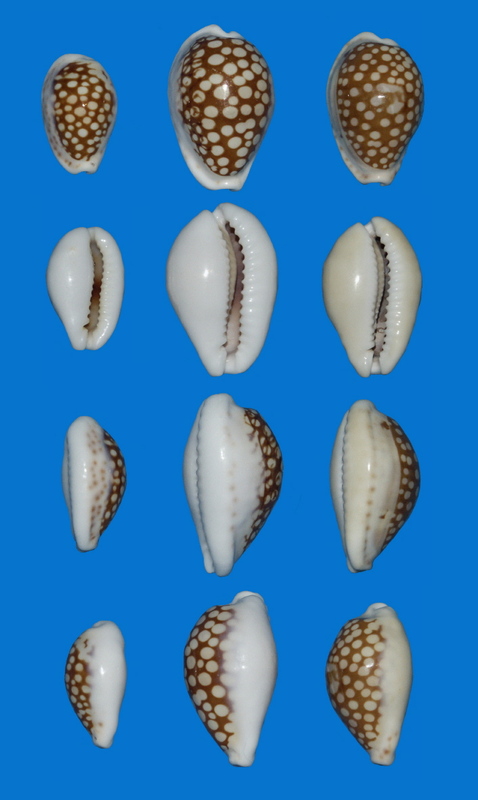 The shells were collected by Nolan Webb during the years 1972 to 1983. "I do have some shells from Mzamba (Northern border of the Transkei) which show all the francescoi features but no marginal spotting at all. All my francescoi (or c. comma) from Southern Natal or the Trankei are not live-taken. Often the dorsal pattern is very much reduced, but the marginal spotting, if present, is still feintly visible." 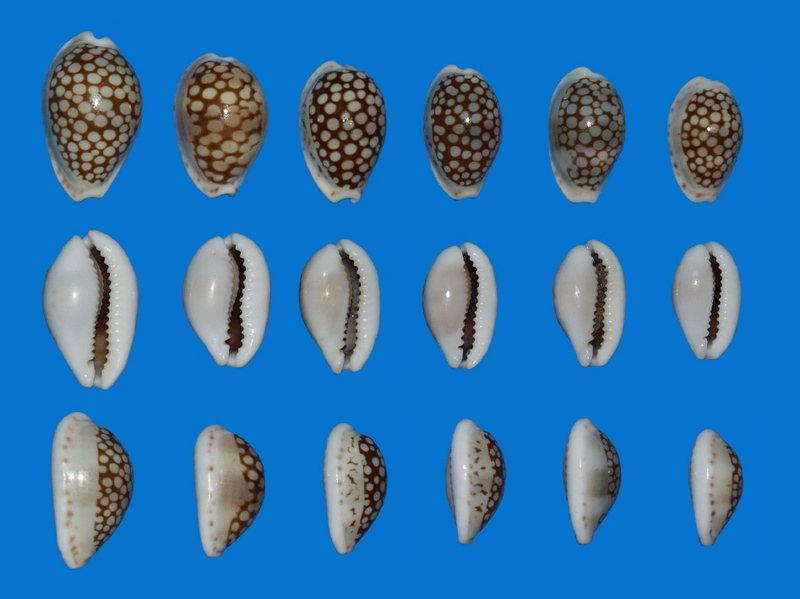 The poor condition of the beached shells deters me from speculating whether this collection of specimens might constitute a valid variation of e. francescoi form mainland. On average they are, however, distinctly different from mainland specimens collected further north. "Retour sur Madagascar. 2eme Partie: Sur les traces d'esontropia"
(Mollusca: Gastropoda, Cypraeidae.) Cribrarula pellisserpentis sp. Nov.
"Les Variations de Cribrarula ou 'en attendant Lorenz'"
Personal correspondence with Lorenz, F.
Personal correspondence with Massier, W.
Personal correspondence with Merlin, J.C. Plate 10: c. comma "form tanga"
Plate 11: Look-alikes of c. comma "form tanga"